Tiếng anh luôn là nấc thang vững chắc để bạn thực hiện ước mơ và khát vọng cùng niềm đam mê. Ngày hôm ngay, aroma sẽ cùng bạn và cô bạn Elena đến nhà Agatha, một cô gái London. Elena đến London để học ngôn ngữ. Bạn học tiếng anh giao tiếp qua video English way DVD 1 cùng Elena sẽ vô cùng thú vị. 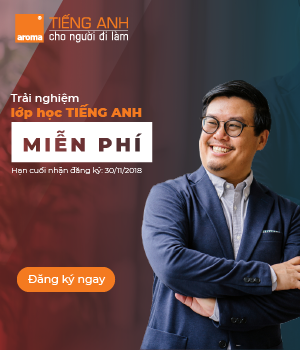 Nào, hãy cùng xem nhé! A: Clean and polish, neat and tidy… Pillow, pillow, pillow, pillow… Sofa! Sofa, sofa, sofa, sofa… Oh table! Table, table, table, table… Shelf! Shelves, shelves, shelves… Mirror! Mirror, mirror on the wall… Who’s the fairest of them all? Eh! It’s the new girl! A: Come in! Come in! So good to see you , Elena. I’m Agatha, Agatha Johnson. B: Please to meet you, Mrs Johnson. A: Welcome to the Johnson family! B: Uhm… I come from Madrid. A: No, no. Welcom to the Johnson family! B: My family is in Spain. A: Yes, yes, I know. You must be tired after your long journey! B: Sorry, I don’t understand. My English is not very good. A: You must be tired after your journey! B: Yes, very tired … very long journey. A: Yes! Well now, let’s sit down together! B: Everything is all right, Mrs Johnson. A: No! You call me Agatha. B: Alright, thank you, Agatha. A: You’re part of the family now. B: Part of the family? B: I have four brothers. A: Four brothers! Wow, well, that’s nice! A: Really? What about sisters? B: I also have three sisters. A: Oh dear! That’s too many! B: My family is very big … many people. A: Yes, Elena, that’s nice! You have a big family, I have a small family. B: Now an extra person, me! A: Yes, Elena, you’re one of the family now. B: Thank you, Agath. That’s nice. A: Well, now it’s teatime. B: Oh, good… one cup of tea, two cups of tea. A: Yes, that’s right! I’ll take your bags to room, then go into the kitchen. What… what heavy bags! A: No, no, I said “heavy”, heavy bags! B: Oh yes, heavy, very heavy bags. A: Okay, I’ll be right back. A: Here we are… Here we are. Tea for two. A: Have a biscuit. They’re homemade. B: Well, I’m a student, and I go to a language school. B: Yes, my English is not very good. A: No, no, no, no… it’s quite good. Where is the school? B: It’s near here, on Exeter Avenue. A: That’s very close! Good! Jusst ten minutes. A: Perhaps Victor could take you by car. A: That is a photo of Victor. B: Oh, he’s a big boy! A: Well, he’s twenty-five! And that is my boyfriend Harold. A: He works in a bank. A: That’s my brother Allan. A: He lives in Sydney. A: Yes, he love it! B: Oh, I want to see Autralia. B: And whose’s that photo? A: Oh, that’s just my sister Betty. A: She live near here. I see her everyday. A: Yes, we go shopping together. A: She’s a very difficult person. B: But she’s your sister. A: Yes, she’s a very difficult sister! This is a photo of my mother and my father. B: Your mother and your father, your parents? A: Yes. My parents, on their anniversary day. A: On the day that they got married. B: Oh yes, their anniversary day. A: And here… is the rest of my family. A: Oh, that’s Victor! He is punctual like always. He arrives at home at five o’clock everyday. B: Everyday? He lives here? A: Yes, he lives with me! B: Oh, he lives here. B: … your cat Felix. B: … and your canary Tweetie! A: Hello Victor! Come in and meet Elena. C: Hi, Agatha! Who are you? A: Darling, this is Elena. C: Elena! Hello Elena! What are you doing here? A: She’s staying with us, sweetheart. C: Why don’t you tell me about thest things? A: I do, I do! I tell you everything, darling! Elena, this is my gorgeous brother, Vic. He’s very handsome, very clever, and very forgetful! B: I’m studying English here. I come from Madrid. Nice to meet you. B: Yes, I want to speak a good English and become a tourist guide. C: Where… where are you studying? B: At the Queens School on Exeter Avenue. You know it? C: Do I know it? … Agatha? Do I know the school? A: Of course darling! Of course he does. C: Of course I do! Silly me. A: Well, I think that we are going to have a wonderful time with Elena staying here. C: Yes, a wonderful time. C: How long are you going to be in London? A: That’s right. Get to know each other and … I’ll go start dinner. B: Can I help you, Agatha? A: No! Sweet girl. You stay right where you are! C: When did you arrive? C: And you’ll be staying with us… untill you go back to Spain? When? B: I go back to Madrid after my English course. My language course is eight weeks. C: I’m sorry. My sister is a little… eccentric. B: Your sister is very nice. C: Tell me… tell me about your family, Elena. B: I have … many sisters and brothers. C: Are you the oldest? C: …. older? Older than you. B: Yes. And… my mother is Carmen and my father is Fernando. C: And this is your first time away from Madrid? B: Yes, I am happy to be in London but also I am a little sad. C: You miss… you mis your big family? B: Yes, but you are very kind and you are very nice. C: Thank you. And what does your… what does your father do back in Madrid? What’s his job? C: Oh! He makes… he makes furniture! C: And your mother? Does she work? B: My mother works very hard in the house… cooking, washing, cleaning. C: Your mother is a housewife. A: So… how are you getting along? C: Jusst fine, thanks, Agatha. B: Very fine. Thank you. A: Wonderful! Now come and help me set the table. Vậy là cô bạn Elena trong “Học tiếng anh giao tiếp qua video English way DVD 1” đã đến nhà Agatha. Cô ấy đã làm quen với một thành viên trong gia đình Agatha rồi. Còn bạn, bạn đã học thêm được các cấu trúc ngữ pháp và thực hành luyện nghe tiếng anh tốt hơn chưa? Bạn hãy rèn luyện chăm chỉ và đón xem các bài học tiếng anh qua video cơ bản của aroma nhé!